Master martial arts in Emma’s Karate Class! 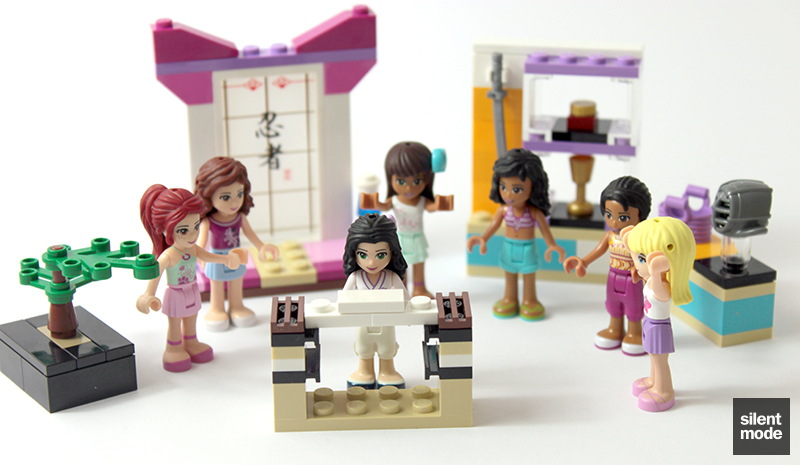 Emma’s dojo is a piece of the Far East, right here in Heartlake City. Practice Emma’s favorite martial arts and help her to prepare for another fantastic performance. Train hard to win the trophy by chopping the practice block in half! After a great practice, wind down in the tranquil environment with the cute bonsai tree and drink some water. 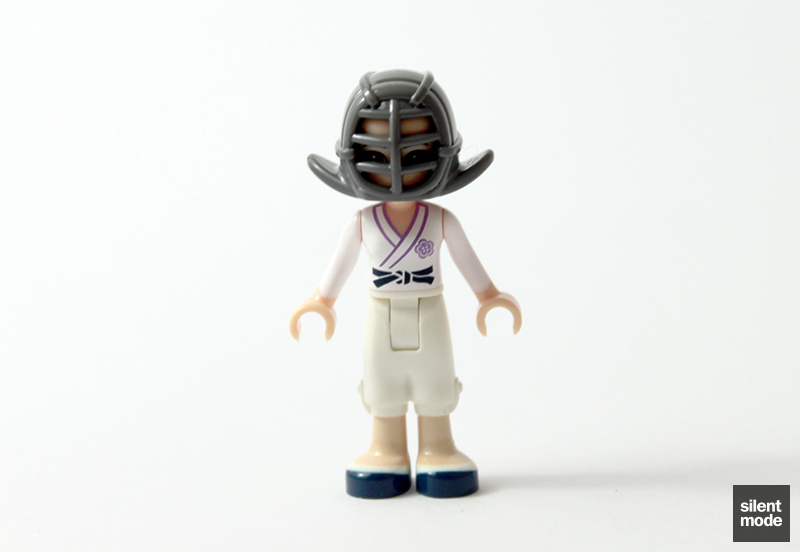 Then use the mask and sword to start mastering kendo! 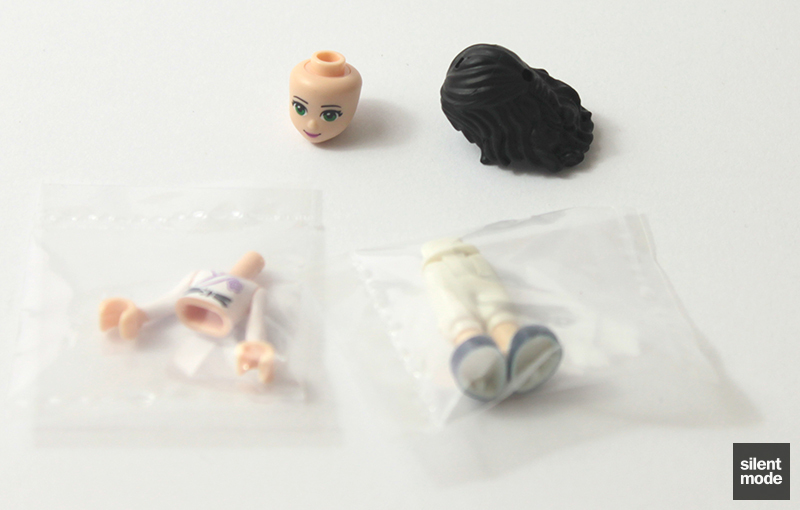 Includes Emma mini-doll figure. Use the chopping function to help Emma break the board in half! Store all of Emma’s trophies in the display case for everybody to admire! Welcome to another Friends review, and unless something dramatically changes this will be my last review for a while, as I get back to more important things such as work, site maintenance and reducing my collection of parts. In our final GBP 9.99 review for the Friends theme we once again visit Emma, who all of a sudden has taken up martial arts and became a karate expert. This leaves Andrea as the only cast member without her own low-priced set. It doesn’t matter for now, because this – being an Emma set – gets an automatic 10/10. Just kidding! Let’s take a look at how the karate thing is working out for Emma. 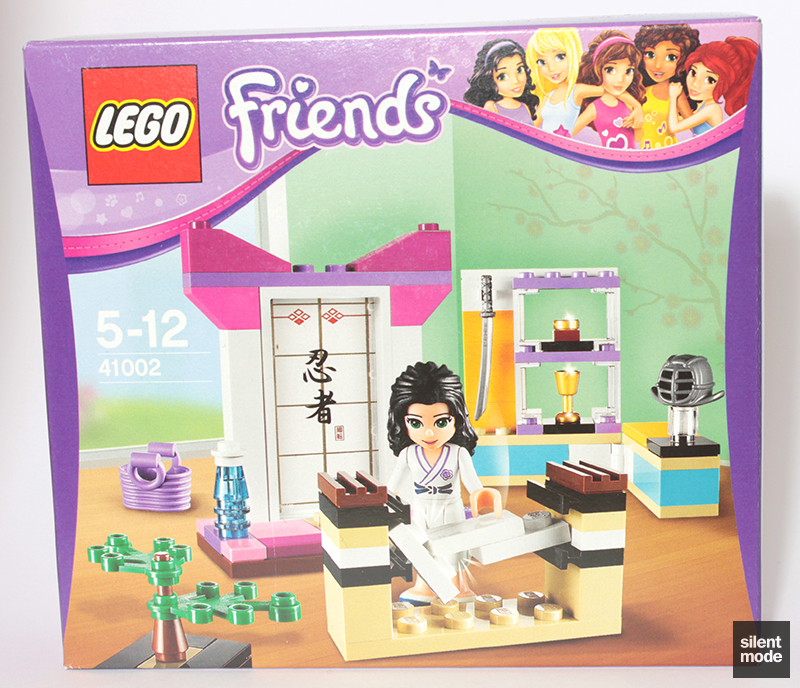 While the front of the box is just as busy as the others in this price range, Emma’s Karate Class has an air of tranquility to it – probably because of the background graphics. The main play feature is pretty much exposed now; nothing more to see. Oh you want to see more? Well the imagery at the back shows what else can be done with the set as is. Don a kendo mask and start swinging, take time out for lunch, or drink from the Holy Grail – the choice is yours. Take a close look at the huddle: Stephanie seems blissfully unaware of how lethal Emma has become, but the others know – especially Olivia. Taking pictures of the sides of the box is generally a waste of time, so from now on I’ll let you guys know what the scale reference is. In this case it’s a Medium Lavender basket piece. You’ll feel the box being a little heavier than a couple of the other sets: that’s mainly because there are more parts in this one, although the part counts aren’t shown as usual. There’s no large plate however, just two bags and the folded instructions. We immediately notice a glass pane in the larger bag, as well as Medium Azure bricks and a small selection of parts in the newer colours. 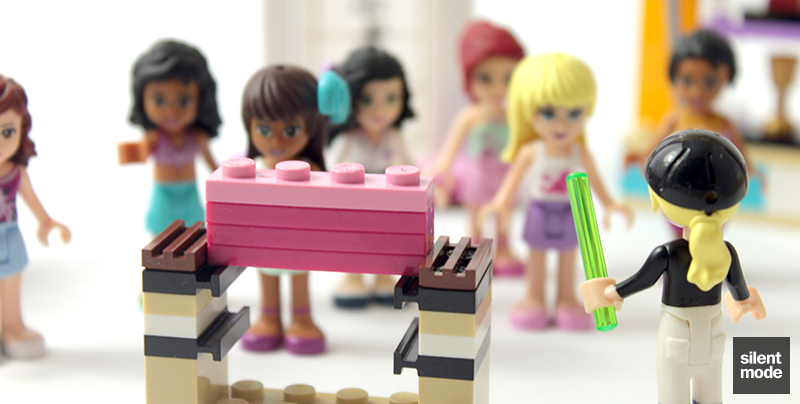 It may not look like there’s a lot of bricks, but these are generally useful ones. 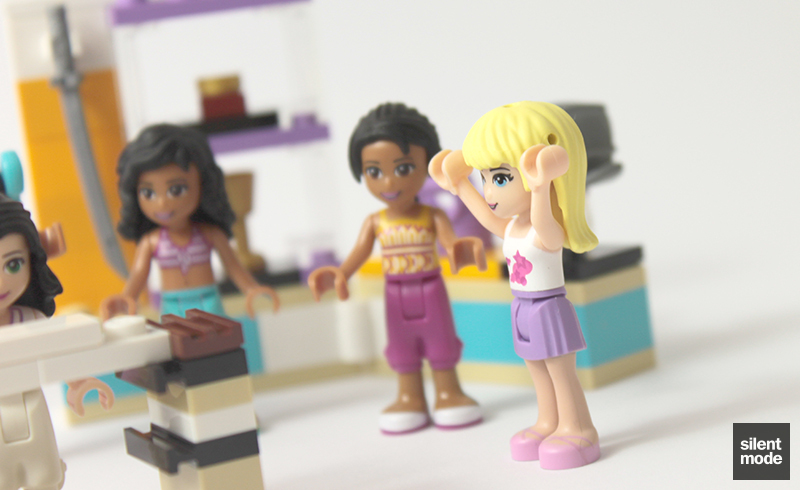 Andrea’s Bunny House had the 1×2 Bright Light Orange bricks, and they also appear in the Rehearsal Stage set. A couple of the first wave sets at this price also have the Medium Azure 2×4 brick. Currently this is the least expensive set you can find the Medium Lavender 1×8 plate in. Otherwise, the other plates in this set are fairly common but useful in their own way. I like my tiles (and I’ve included jumper plates here because they look more like tiles than plates), and this set doesn’t disappoint with its selection. 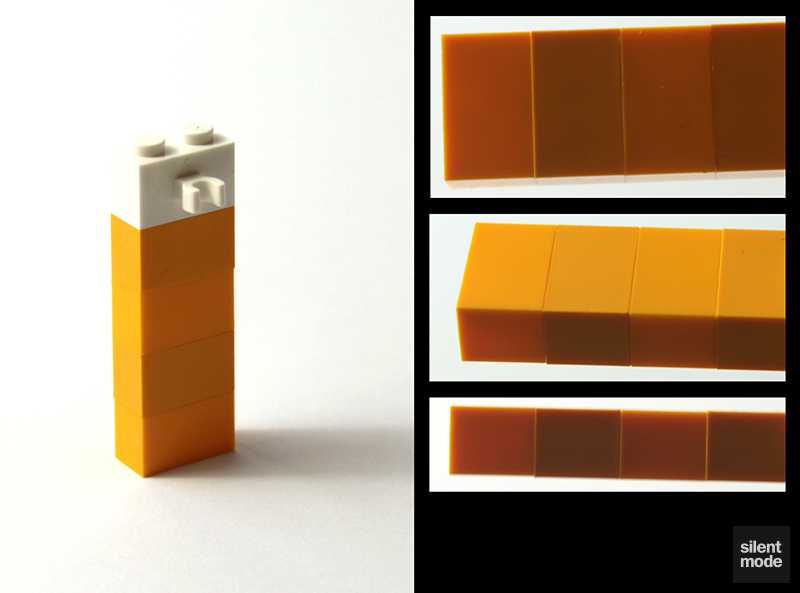 The Bright Light Orange 2×4 also appears in two other sets, but is easily the star of the show. 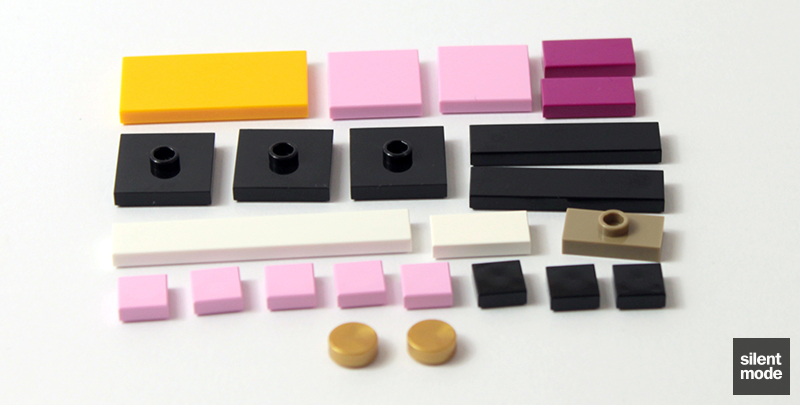 Notice how the 2×2 Black jumper plates are becoming much more common now, since their introduction in the LEGO Champion board game. The decorated glass pane is the same one as in the Ninjago theme, and is a great and inexpensive way for anyone to obtain them if they’ve missed them. These probably fetched ridiculous prices on the black market then, and they probably will now. The Dark Pink inverted slopes also appear in the second wave Adventure Camper. The Medium Lavender basket is introduced in this wave, and appears in Heartlake City Pool: the most expensive set in this wave. 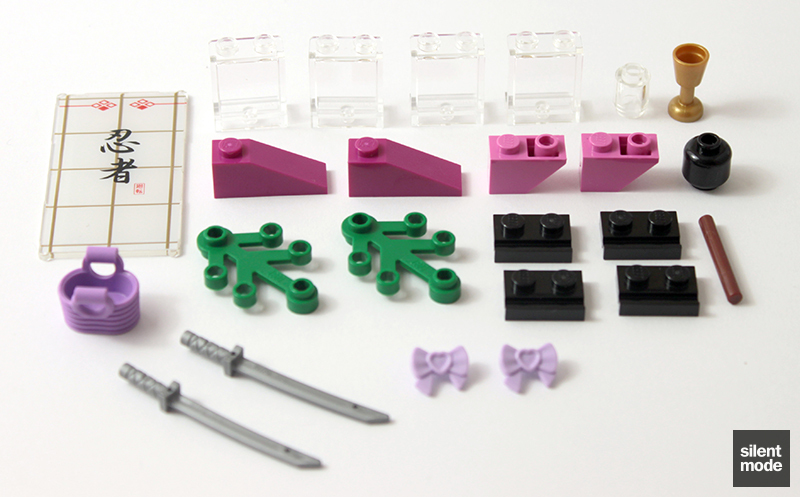 This set is also the least expensive you’ll find those Trans Clear panels in. 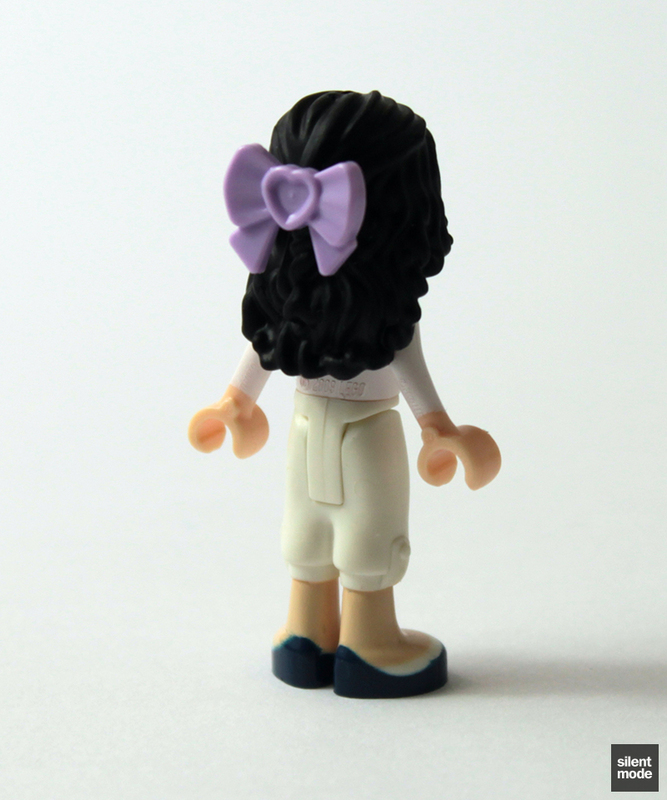 You’ll also recognise the Lavender bows from Turtle’s Little Oasis. So here’s Emma in her brand-new, shiny karate outfit (karate gi): another reason to buy this set if you’re into minidoll collecting. But for anyone who’s squeamish: the white paint on the torso is slightly transparent, as is usually the case with light paint on darker surfaces. Slightly unusual is that Emma is wearing shoes, when karate practitioners are usually barefoot. I’m not complaining. 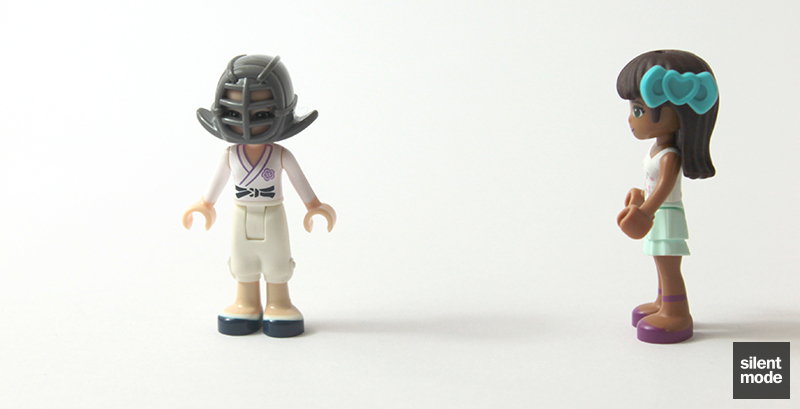 Though you might recognise the kendo helmet from the Ninjago theme, this part is exclusive to this set: the Ninjago variety has painted bars on the front. 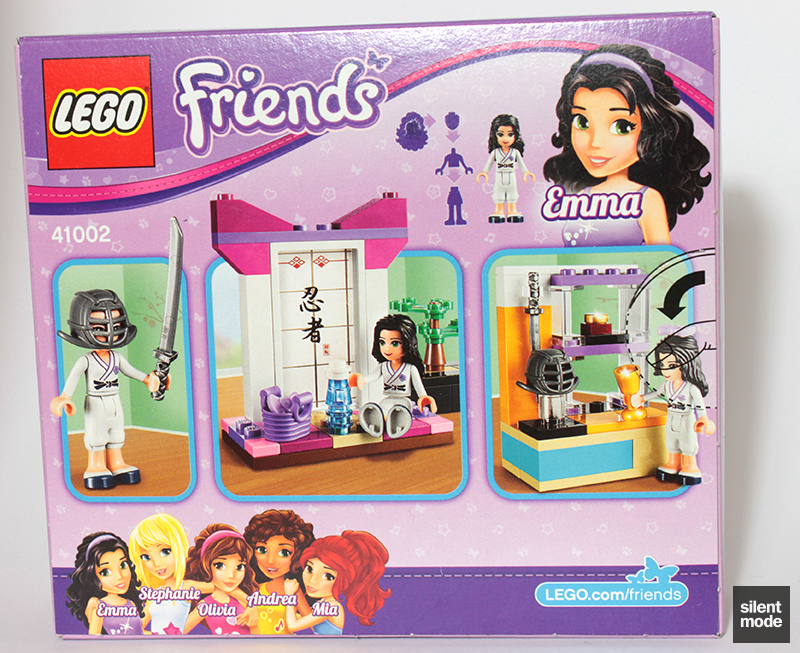 Emma can wear this helmet in place of her hairpiece, as was shown on the back of the box. Not shown until the beginning of the instructions is Emma wearing one of the included bows. You’ll notice that Emma doesn’t have an animal companion for whatever reason, but one in a karate class would be a little too much. Not a simplistic or kludgy bush this time, but an elegant-looking bonsai tree in a pot. However you feel about the cliché of having such a thing, it does look sweet. This simple-looking structure is actually one of those things where you chop planks of wood or various other materials. The chopping material comprises of two plates joined together by a tile, and this can be placed on the top or bottom rung. It’s a little tricky to position the piece, but not too difficult. Having thought about it: the chopping board could just as easily have been two 1×2 tiles with a 1×2 plate underneath, if we wanted to have a smooth-looking surface for Emma to chop. 2×2 plates and tiles may work just as well also. Not sure what the technical or definitive name for this structure is, but the famous decorated glass panel forms the centrepiece, surrounded by Magenta and Bright Pink elements. It’s very girly! As the last few pieces are placed on top, I finally realise what this is: it’s a portal into the world of Ninjago. Much like a wardrobe takes unsuspecting children to Narnia, or rabbit holes lead to Wonderland, or kneeling in front of a wall with the red crystal equipped will send someone to Oz. Emma is the Pink Ninja! All we’re missing is definitive evidence. Also included with the gate is a makeshift bottle of mineral water. The beginning of the last build involves a White hinge brick connecting these two bases. The kendo helmet is stored on the display case when not being worn by Emma. To go with the Holy Grail is another precious golden artefact, origins unknown. Unfortunately I came across a quality issue as I neared the end of the build. Two of the Bright Light Orange bricks were not only translucent, but they were uneven with the other two bricks when stacked. You can see some very obvious differences in colour (and the jagged edges) here. The show must go on, I guess. The pillar is attached to the base of the display cabinet, providing a spot to place one of Emma’s lethal samurai swords. A few extra elements on top completes the display case. 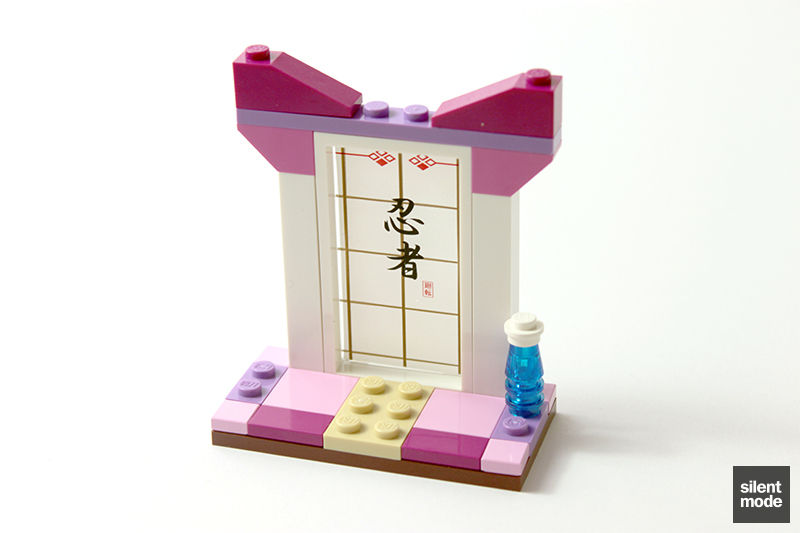 If necessary the display case can be folded for storage, or to provide a more compact design for the smaller dojo. I like the compact version. 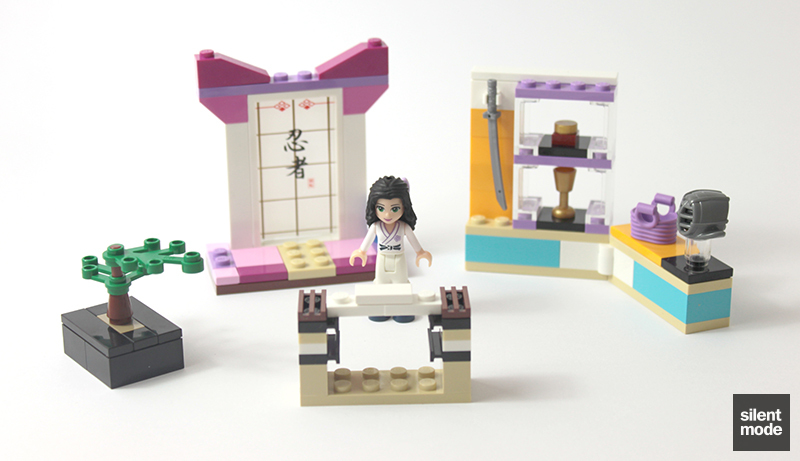 Deep within Emma’s estate, she peruses her newly built and furnished dojo: a front to conceal the Holy Grail. She figured she’d take up a new hobby, and with the little time she had to herself she travelled through the portal to Ninjago, where a wise master taught her the mysterious arts. That’s my story, and I’m sticking with it. Nothing too surprising is left over from the build, but we do have another round tile to play with, as well as an extra sword in case one of Emma’s friends wants to get in on the action. These are all potentially useful parts. like seeing a female taking up martial arts, particularly an attractive one. But even if you’re not into that whole female empowerment thing, this is a decent set. 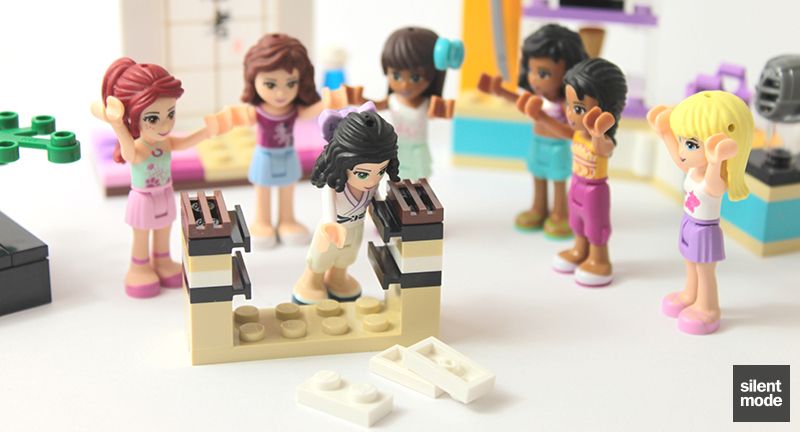 It could be argued that the lack of animals in this set is made up for by the selection of parts, and we also have Emma in a karate outfit to put icing on the cake. The set itself is definitely more of a display piece than something to play with, although one can experiment with a crazed minidoll wearing the kendo mask, waving a sword around town. (I don’t know how that would work, especially since minidoll arms are very inflexible.) The display case gives young builders an idea of how to build effective furniture, as well as providing some room for expansion: what else can we put on those shelves, or in place of the mask? It’s between the display case and the bonsai tree for my favourite part of the set, and the water bottle is pretty cool too. Unfortunately the set is let down by the aforementioned quality issue: the translucent bricks. This is something that’s plagued sets before it, and an issue I came across when building the Winter Village Cottage, but doesn’t seem to have been fixed despite it being reported. As far as I know it was only those two bricks that were affected, but it’s an issue to be vigilant of. I could see myself getting more of this set, particularly if I wanted to kit some minidolls out with a karate outfit, but I wonder if the translucent torso paint is also a quality issue, given that it’s shown as plain white on the box? The chopping board mechanism, while simple, was a nice touch, and in general the whole set was well designed. There were perhaps one too many colours: either Dark Pink or Magenta could be considered "extra". The bonsai tree in particular was an interesting build, and I was pleased with the outcome of the display case. Everything else was quick to build, but felt a little simple. Despite the "extra" colour there's a really good selection of parts in this set, let down by the two translucent bricks (and in some ways, the see-through minidoll torso). Definitely more of a display piece, though there is limited playability with the sword, the kendo helmet and of course the chopping board. Certainly more playable than Olivia's Newborn Foal. Those quality issues, man! I would feel a lot better buying multiples of these (for whatever reason) if I could be sure I'd get good quality parts. Definitely one to consider if discounted. Based on these scores I’d give this set 7.2/10… homegirl falls a little short this time, though it’s not her fault. For the time being, that concludes my coverage of the Friends theme. Here’s hoping I do some more set reviews (of other themes as well) in the near future. 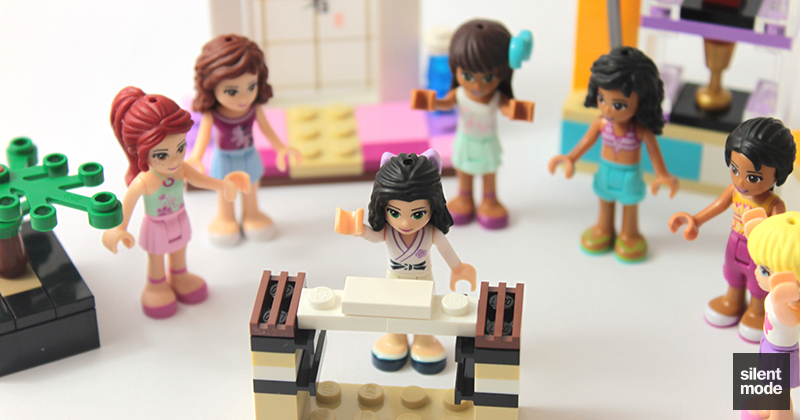 It’s Emma’s big moment: she’s invited all her friends to her private dojo, where she hopes to demonstrate her skills. She’s trained hard for years, and last-minute nerves are setting in.